Salutations to Lord Siva, the vanquisher of Cupid, the bestower of eternal bliss and immortality, the protector of all beings, destroyer of sins, the Lord of the gods, who wears a tiger-skin, the best among objects of worship, through whose matted hair the Ganga flows. Lord Siva is the pure, changeless, attributeless, all-pervading transcendental consciousness. He is the inactive (Nishkriya) Purusha. Prakriti is dancing on His breast and performing the creative, preservative and destructive processes. When there is neither light nor darkness, neither form nor energy, neither sound nor matter, when there is no manifestation of phenomenal existence, Siva alone exists in Himself. He is timeless, spaceless, birthless, deathless, decayless. He is beyond the pairs of opposites. He is the Impersonal Absolute Brahman. He is untouched by pleasure and pain, good and evil. He cannot be seen by the eyes but He can be realised within the heart through devotion and meditation. Siva is also the Supreme personal God when He is identified with His power. He is then omnipotent, omniscient active God. He dances in supreme joy and creates, sustains and destroys with the rhythm of His dancing movements. The Jivas and the world originate from Him, exist in Him, are sustained and rejected by Him and are ultimately merged in Him. He is the support, source and substratum of the whole world. He is an embodiment of Truth, Beauty, Goodness and Bliss. He is Satyam, Sivam, Subham, Sundaram, Kantam. He is the God of gods, Deva-Deva. He is the Great Deity Mahadeva. He is the God of manes (Prajapati). He is the most awe-inspiring and terrifying deity, Rudra, with Trisul or trident in His hand. He is the most easily pleased (Asutosha). He is accessible to all. Even the untouchable Chandalas and the illiterate rustics can approach Him. He is the source of all knowledge and wisdom. He is an ideal Yogi and Muni. He is the ideal head of an ideal family with Uma as His devoted wife, Lord Subrahmanya, the brave general of strength and courage, Lord Ganesa, the remover of all obstacles. Lord Siva represents the destructive aspect of Brahman. That portion of Brahman that is enveloped by Tamo-Guna-Pradhana Maya is Lord Siva who is the all-pervading Isvara and who also dwells in Mount Kailas. He is the Bhandara or store-house for wisdom. Siva minus Parvati or Kali or Durga is Nirguna Brahman Himself. With Maya-Parvati He becomes the Saguna Brahman for the purpose of pious devotion of His devotees. Devotees of Rama must worship Lord Siva for 3 or 6 months before they take to worship of Rama. Rama Himself worshipped Lord Siva at the famous Ramesvaram. Lord Siva is the Lord of Ascetics and Lord of Yogins, robed in space (Digambara). His Trisul (trident) that is held in His right hand represents the three Gunas—Sattva, Rajas and Tamas. That is the emblem of Sovereignty. He wields the world through these three Gunas. The Damaru in His left hand represents the Sabda Brahman. It represents OM from which all languages are formed. It is He who formed the Sanskrit language out of the Damaru. The crescent moon indicates that He has controlled the mind perfectly. The flow of the Ganga represents the nectar of Immortality. Elephant represents symbolically pride. His wearing the skin of the elephant denotes that He has controlled pride. Tiger represents lust; His sitting on tiger’s skin indicates that He has conquered lust. His holding a deer on one hand indicates that He has removed the Chanchalata (tossing) of the mind. Deer jumps from one place to another swiftly. His wearing of serpents denotes wisdom and eternity. Serpents live for a large number of years. He is Trilochana, the three-eyed One, in the centre of whose forehead is the third eye, the eye of wisdom. ‘Hoam’ is the Bija Akshara of Lord Siva. He is Sivam (auspicious, Subham), Sundaram (beautiful), Kantam (effulgent). “Santam Sivam Advaitam” (Mandukya Upanishad). I bow with folded hands crores of times at the lotus-feet of that Lord Siva who is non-dual, who is the Adhishthana, or support for the world and all minds, who is Sat-Chit-Ananda, who is the Ruler, the Antaryamin, the Sakshi (silent witness) for everything, who is self-effulgent, self-existent and self-contained (Pari-purna), who is the remover of the primitive Avidya and who is the Adi-Guru or Parama-Guru or Jagad-Guru. That Lord Siva I am in essence. Sivoham, Sivoham, Sivoham. Serpent is the Jiva or the individual soul which rests upon Siva, the Paramatman or the Supreme Soul. The five hoods mean the five senses or the five Tattvas, viz., earth, water, fire, air and ether. They also represent the five Pranas, which hiss in the body like the serpent. The inhalation and exhalation are like the hissing of the serpent. Lord Siva Himself became the five Tanmatras, the five Jnanendriyas, the five Karmendriyas and other groups of five. The individual soul enjoys the worldly objects through these Tattvas. When the individual attains knowledge through control of the senses and the mind, he finds his eternal resting abode in Lord Siva, the Supreme Soul. This is the esoteric significance of Lord Siva wearing the snake on His body. Lord Siva is absolutely fearless. Srutis declare, “This Brahman is fearless (Abhayam), Immortal (Amritam).” Worldly people are afraid even at the very sight of a snake but Lord Siva is wearing serpents as ornaments on His body. This indicates that Lord Siva is absolutely fearless and immortal. Generally serpents live for hundreds of years. Wearing of serpents by Lord Siva signifies that He is Eternal. Namassivaya is the Mantra of Lord Siva. ‘Na’ represents earth and Brahma; ‘Ma’ represents water and Vishnu; ‘Si’ fire and Rudra; ‘Va’ Vayu and Mahesvara; ‘Ya’ Akasa and Sadasiva and also the Jiva. Lord Siva has white complexion. What is the significance of white colour? He teaches silently that people should have pure heart and entertain pure thoughts and should be free from crookedness, diplomacy, cunningness, jealousy, hatred, etc. He wears three white-lined Bhasma or Vibhuti on His forehead. What is the significance of this? He teaches silently that people should destroy the three impurities, viz., Anava (egoism), Karma (action with expectation of fruits), and Maya (illusion), and the three desires or Eshanas, viz., desire for landed property, desire for woman, desire for gold, and the three Vasanas, viz., Lokavasana, Dehavasana and Sastravasana, and then attain Him with a pure heart. What does the Balipitha or altar which stands in front of the sanctum sanctorum of the Siva’s temple represent? People should destroy their egoism and mineness (Ahamta and Mamata) before they attain the Lord. This is the significance. What does Nandi or the bull which is in front of Sivalinga represent? Nandi is the attendant or doorkeeper of Siva. He is the vehicle of Lord Siva. He represents Satsanga. If you make association with the sages, you are sure to attain God-realisation. Sages will show you the way to reach Him. They will remove pitfalls or snares that lie on your path. They will clear your doubts and instil in your heart dispassion, discrimination and knowledge. There is no other safe boat than Satsanga to reach the other shore of fearlessness and immortality. Even a moment’s Satsanga or association with the sages, is a great blessing to the aspirants and the worldly-minded persons. They get firm conviction in the existence of God through Satsanga. The sages remove the worldly Samskaras. The company of sages is a formidable fortress to protect oneself from the temptations of Maya. Lord Siva represents the destructive aspect of the Godhead. He is seen absorbed on the mountain peak of Kailas. He is an embodiment of serenity, renunciation and indifference to the world. The third eye in the centre of His forehead represents His destructive energy which when let loose destroys the world. Nandi is His favourite. He is the door-Keeper. He is seen hushing all nature, so that the Lord may not be disturbed in His Samadhi. The Lord has five faces, ten hands, ten eyes, two feet. Vrishabha or the bull represents Dharma Devata. Lord Siva rides on the bull. Bull is His vehicle. This denotes that Lord Siva is the protector of Dharma, is an embodiment of Dharma or righteousness. Deer represents the Vedas. Its four legs are the four Vedas. Lord Siva is holding the deer in His hand. This indicates that He is the Lord of the Vedas. He has sword in one of His hands. This signifies that He is the destroyer of births and deaths. The fire in one of His hands shows that He protects the Jivas by burning all fetters. Salutations and adorations to the blissful Lord Siva, the lover of Uma or Parvati, the Lord of all beings (Pasupati). “Alankarapriyo Vishnuh, Abhishekapriyah Sivah—Lord Vishnu is very fond of Alankara (fine dress, beautiful ornaments, etc. ); Siva is fond of Abhisheka.” In Siva temples, a pot made up of copper or brass with a hole in the centre is kept hanging over the image or Linga of Siva, and water is falling on the image throughout day and night. Pouring over the Linga, water, milk, ghee, curd, honey, cocoanut water, Panchamrita, etc., is Abhisheka. Abhisheka is done for Lord Siva. Rudra is chanted along with the Abhisheka. Lord Siva is propitiated by Abhisheka. Lord Siva drank the poison that emanated from the ocean and wore the Ganga and moon on His head to cool His head. He has the fiery third eye. Constant Abhisheka cools this eye. The greatest and the highest Abhisheka is to pour the waters of pure love on the Atmalinga of the lotus of the heart. The external Abhisheka with various objects will help the growth of devotion and adoration for Lord Siva and eventually lead to internal Abhisheka with pure abundant flow of love. Abhisheka is a part of Siva Puja. Without Abhisheka, worship of Siva is incomplete. During Abhisheka Rudra, Purushasukta, Chamaka, Maha-mrityunjaya Japa, etc., are chanted in a particular rhythm and order. Monday is very important day for Lord Siva and the thirteenth day of the fortnight (Pradosha) is very sacred. On these days, devotees of Siva worship Him with special Puja, Abhisheka with Ekadasa-Rudra, Archana, offering plenty of Prasad, and illumination. In Ekadasa-Rudra Abhisheka, every Rudra is chanted with distinctive articles for Abhisheka. Ganga water, milk, ghee, honey, rose-water, cocoanut water, sandal paste, Panchamrita, scented oil, sugarcane juice and lime juice are made use of for Abhisheka. After every Abhisheka, pure water is poured over the head of Siva. When Rudra is repeated once, the different articles of Abhisheka are made use of after every stanza of the Rudra. The Abhisheka water or other articles used for Abhisheka are considered very sacred and bestow immense benefits on the devotees who take it as the Lord’s Prasad. It purifies the heart and destroys countless sins. You must take it with intense Bhava and faith. When you do Abhisheka with Bhava and devotion, your mind is concentrated. Your heart is filled with the image of the Lord and divine thoughts. You forget your body and its relation and surroundings. Egoism gradually vanishes. When there is forgetfulness, you begin to enjoy and taste the eternal bliss of Lord Siva. Recitation of Rudra or Om Namassivaya purifies the mind and fills it with Sattva. If you do Abhisheka with Rudrapatha in the name of a person suffering from any disease he will be soon freed from that disease. Incurable diseases are cured by Abhisheka. Abhisheka bestows health, wealth, prosperity, progeny, etc. Abhisheka on Monday is most auspicious. By offering Panchamrita, honey, milk, etc., to the Lord, thoughts of your body diminish. Selfishness slowly vanishes. You derive immense joy. You begin to increase your offerings unto the Lord. Therefore, self-sacrifice and self-surrender come in. Naturally, there is an outpouring from your heart, “I am Thine, my Lord. All is Thine, my Lord”. Kannappa Nayanar, a great devotee of Lord Siva, a hunter by profession, did Abhisheka with the water in his mouth for the Linga at Kalahasti in South India and propitiated Lord Siva. Lord Siva is pleased by pure devotion. It is the mental Bhava that counts and not the outward show. Lord Siva said to the temple priest: “This water from the mouth of Kannappa, my beloved devotee, is more pure than the water of the Ganga”. A devotee should be regular in doing Abhisheka for the Lord. He should get by heart Rudra and Chamakam. Ekadasa Rudra is more powerful and effective. In Northern India, every man or woman takes a lota of water and pours it on the image of Siva. This also causes beneficial results and brings about the fulfilment of one’s desire. Abhisheka on Sivaratri day is very effective. May you all recite Rudrapatha which describes the glory of Lord Siva and His manifestations in every living being, in every animate and inanimate being! May you do Abhisheka daily and thus obtain the grace of Lord Siva! 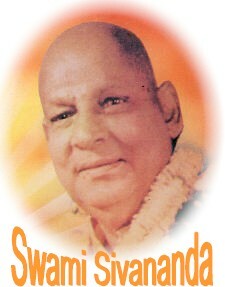 May Lord Visvanatha bless you all! Fruits of Abhisheka and Rudra Japa in Siva's Temple. Chamaka is divided into eleven sections. Each of these is then combined with Namaka (Rudra) and repeated. This is called Rudra. Eleven such Rudras make one Laghu Rudra. Eleven Laghu Rudras make one Maharudra. Eleven Maharudras make one Atirudra. 1 Rudra Freedom from Bala graha (diseases common to children). 3 Rudra Freedom from imminent difficulties with which one is faced. 5 Rudra Freedom from the evil effects of certain planets occupying unfavourable positions. 7 Rudra Freedom from great fear. 9 Rudra The fruit of one Vajapeya sacrifice; and also attainment of peace of mind. 11 Rudra Getting the favour of kings and great wealth. 33 Rudra Attainment of wishes for objects and having no enemies. 77 Rudra Enjoyment of great happiness. 99 Rudra Attainment of son, grandson, wealth, grain, Dharma, Artha, Kama and Moksha and freedom from death. 1 Maharudra Attainment of the favour of kings and becoming the Lord of great wealth. 3 Maharudra Fulfilment of impossible tasks. 5 Maharudra Acquirement of vast lands. 7 Maharudra Attainment of the seven worlds. 9 Maharudra Freedom from births and deaths. Materials for Abhisheka: Pure water, milk, sugarcane juice, ghee, honey, waters of sacred rivers, sea water. For getting rain, Abhisheka should be done with pure water. For freedom from diseases, and for begetting a son, Abhisheka should be done with milk. If Abhisheka is done with milk, even a barren woman begets children. The person also attains plenty of cows. If Abhisheka is done with Kusa water, one becomes free from all diseases. He who desires wealth, should perform Abhisheka with ghee, honey and sugarcane juice. He who desires Moksha, should do Abhisheka with sacred waters.